The DNR is conducting a regional survey of gold in till in Western St. Louis and Northeastern Itasca Counties, Minnesota, USA. In this region, an Archean granite-greenstone terrane is overlain by relatively thin layers of Rainy Lobe till and other glacially-derived sediments. In comparable portions of the Archean Superior Province, the quantity and morphology of gold grains within samples of glacial till has led to the identification of associated bedrock gold deposits. There are two distinct terranes within the Survey Area. The Bigfork East Project Area (BFE) is an upland area with bedrock exposures of metavolcanic and volcanoclastics. These mafic units have discontinuous layers of iron formation, and are cut by granitic stocks and plutons. The Calumet Project Area (Calumet) is located between the BFE to the north, and the Proterzoic Biwabik Iron Formation to the south. Samples within the Calumet were collected where the Giants Range Batholith is cross-cut by major structural features (e.g. Calumet Fault). Till samples were collected from both the BFE and Calumet areas in 2008. While gold grain counts above background levels were observed in both areas, counts in the BFE were significantly higher, and anomalous in their distribution of “reshaped” versus “pristine” morphologies. 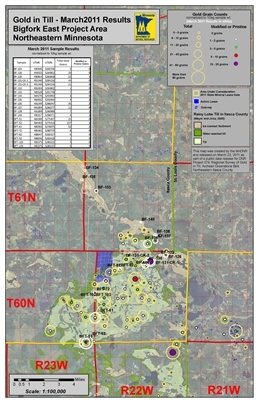 Subsequent rounds of sampling have established the BFE as the largest area with anomalously high gold in till values in Minnesota, and document a complex deposition history with possible paleoplacer intermediary point sources. The results of this survey will support land management decisions in the region of high mineral potential, and may provide useful guidance for private mineral exploration companies that are considering gold exploration programs on State lands. The DNR is releasing analytical results and field data for twenty-one (21) new samples within the BFE. These samples were collected between May and November 2011, either as shallow shovel samples or within excavated test pits. A DNR open-file report will be released separately that describes the geochemical survey methods and results in greater detail.